We all have times where we feel anxious or stressed and it can be hard to snap out of it. Distraction techniques are often advised, and this can be anything from reading or going for a walk, to puzzles like sudoku and crosswords. Here are a few more ideas for you. Playing cards, even playing solitaire alone, can help with stress a lot. 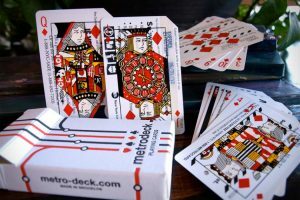 Whether you do this with an actual pack of playing cards or on a computer using one of the many card games available, it works the same. Playing on a computer means you can play a 2-person game such as Cribbage or Gun Rummy too. Fast becoming popular with those who love handmade crafts, embroidery is also a good way to personalise items for friends. If you are a beginner then you can buy a kit that includes everything you need to create your picture or cushion cover. You can spend hours creating a piece and in the end, you will have something lovely to show for your efforts. Those with anxiety or stress may not feel like venturing out to a swimming pool bath, but by doing so, you will not only get exercise, you can also keep your body fit and toned, so if you don’t feel great on the inside, you will certainly look good on the outside – an excellent boost to confidence and self esteem. It is also worth remembering that exercise releases endorphins, a hormone that helps people feel happy. You don’t have to be a great artist to enjoy painting, all you need is a paintbrush, some paint and an object to put the paint on to. If you are not keen on creating your own canvas, why not turn your hand to a little shabby chic and paint a side table, a lamp stand or even your picture frames. The shabby chic style is really a trend, and you can relieve your stress at the same time.